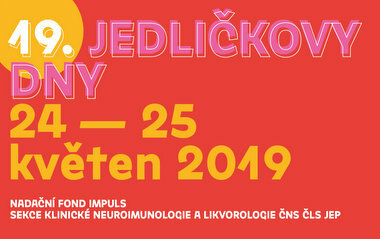 Prestigious conference Jedlička Neuroimmunological and Liquorological Days is a professional event organized by IMPULS, Endowment Fund and the Section for Neuroimmunology and Liquorology of the Czech Medical Association of J. E. Purkyně (ČLS JEP). The event will be attended by doctors and scientists from the Czech Republic and abroad. The evening is not covered by the sponsorship of pharmaceutical companies and is not a part of a professional program. For more information, please visit www.mhconsulting.cz,www.imuno.neurologiefnhk.cz a www.neurovedy.eu. MH Consulting s. r. o.
Jedlička Days, an event named after one of the first neurologists who was devoted to diagnostics, and treatment of multiple sclerosis, take place every two years. And traditionally it is a significant opportunity to share experience in the field of neurology. Participants appreciate especially its high professional level, and scientifically beneficial contents of the event. Symposium is included in the system of subsequent medical education accredited by the CMC (ČLK). The final agenda is available at these pages, www.imuno.neurologiefnhk.cz or www.neurovedy.eu. in Kaiserstein Palace on Lesser Town Square in Prague. Professional program has been headed by neurologists Eva Havrdová, Dana Horáková, Jiří Piťha, Pavel Šťourač, Radomír Taláb and Marta Vachová. In addition Heinz Wiendl from the University of Münster, Germany, has been introduced as a guest speaker. Main topics were liquorology and immulonogy, symptomatic treatment and rehabilitation, social programs and patient organizations.